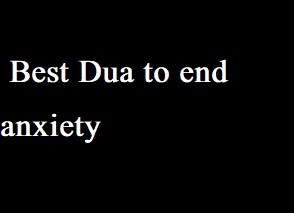 Dua-prayer for anxiety in Islam: Anxiety can hurt a person's day-to-day life, but being a believer one should not worry as we have powerful and effective duas/prayers at our disposal. Let's be thankful to Allah for guiding us and giving us the right tools to get rid of anxiety that eats not only our physical but spiritual life as well. Translation: "O Living ! O Sustaining ! By Your mercy I seek help"
This dua/prayer can be recited whenever you like, but a more aspect regarding the effectiveness of it is that you must understand the meaning of what is about. This dua has proven to remove anxiety as Quran says one of the major causes for anxiety is not remembering Allah and doing His dhikr. Our daily life, work, relationships and social issues can cause us anxiety and if this problem is not fixed at the right time, we run the risk of losing health (mental and physical), work and even relationship because the likely outcome of prolonged anxiety is depression. Spiritual issues too can cause anxiety in a person. The outcome from spiritual problems are hard to trace and often leave the victim at the mercy of amils, quacks and even black magic practitioners. Islam does not leave us in a tight spot and sends us in the battlefield without any preparation. Prophet Mohammad Peace Be Upon Him has taught us dozens of duas-prayers to combat spiritual and psychological problems - anxiety being one of them.